What isn’t always known about Baltic Porter’s is that the style is not an ale, it’s made with a bottom-fermenting lager yeast. Not very many breweries in the United States make this style, in fact the only popular ones that I can think of include the Alaskan Brewing (I’m not sure if this is a lager though) and Great Divide Baltic Porter. Typically these beers are brewed stronger with higher IBU’s but the bitter hop quality is less present than you might expect. These beers also have a higher degree of complexity than their porter-families, often with some smokiness present, aromas and flavors can include dark fruits, chocolate, and more. 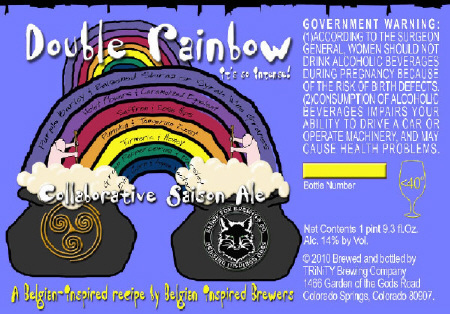 Black Fox and Trinity have collaborated to make a beer based off that crazy Double Rainbow video everyone has watched on Youtube. You may have heard a little about the beer, but it will be released at their collaborative beer dinner. – Farmhouse Cafe Blanc / Panko and White Coffee Crusted Ahi Tuna on Forbidden Rice with a Miso Foam. – Don’t Call Me Wit / Fennel and Frisee Salad with Tomatoes, Cucumbers, Pickled Pumpkin, Basil, and a Citrus Dressing. – Farmhouse Peche Noir / Curry Cold-Smoked Peach and Butternut Squash Soup. – La Noche Del Diablo / Spicy Teriyaki Duck Breast on Vinegar Glazed Stir Fry. – Emma’s Coffin Pumpkin Ale / Grilled Kaributa on Garam Masala Pumpkin Mash with Micro Greens Tossed in a Coconut Raisin Dressing. – Double Rainbow / Deconstructed Reconstructed Rainbow Sherbet.